If there is one country where buying a train ticket or a reservation is not easy and very slow, it is definitely Russia. Besides the date, departure and arrival stations, the clerk has to type into the computer a lot of details such as name (written in cyrillic letters on the visa), passport number and visa number, all this separated by spaces and symbols, as there is no such software with simply a box for each entry. Only one window serves foreigners, with its own opening times and staffed by a clerk who does not necessarily speak english. Fortunately, I speak a little russian, which came in very handy. 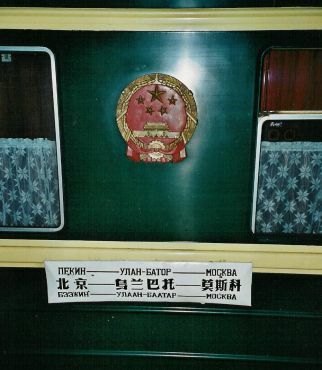 In Moscow, with the help of a russian friend, I bought a ticket Moscow-Beijing and then I bought reservations for the sleeper trains for each leg of the trip, as I went along. This turned out to be a little unusual. In Krasnoyarsk, I got a nice example of the sort of things russians must cope with everyday. I wanted to buy a reservation for the sleeper to Irkutsk. At the station, I could not find this "mezhdunarodna kassa", the international window so I asked at the information window. The lady took my ticket and when I told her I wanted a reservation to Irkutsk, she replied "nyet, nye mozhno" (no, not possible) and gave me the ticket back. I insisted, and she told me to go to the "kassa", i.e. the normal window, where I had to queue for a little while. Naturally, this normal window does not serve foreigners and they redirected me to a totally different building, in town. Once there, I queued at the only window that was open. There were only a few persons in front of me but it took 10 minutes for each of them (if things were the same in China, I would probably still be in Beijing or Xi'an as you read this). On top of this, there was a power cut which lasted a good half hour and of course everything stopped, russians took a seat and patiently waited. When the electricity came back, queuing resumed and when my turn came, the lady redirected me to the next window, the "mezhdunarodna kassa" which was closed. As it the working times were not posted, I asked what time it opens : "syeychas" (immediately). After another 10 minutes, a grumpy lady arrived and again, after looking at my ticket : "nyet, nye mozhno" (no, not possible). I insisted, she insisted, I insisted, she called someone on the phone, and eventually, started typing on the computer, entering the details from my visa and my passport. In the end I got my reservation but it took in total one and a half hour. In Irkutsk, the lady spoke english, and things went very smoothly. However, in Ulan-Ude, the computer kept replying "0 - NYET" after she had typed everything. She had to call someone over, they looked into the manual, checked the spaces and the characters on the screen, phoned someone else, and eventually I was told to return next day. The problem was that the train had not yet left from its departure station. I came back in company of a local Buryat lady met in the bus, on the way back from a buddhist temple (the Buryats people live in this part of Russia and they are related ethnically to the Mongols). The lady at the window also recognised me and things went without problem.